About East Richmond Nurseries Inc. | Vancouver Nursery, Wholesale Trees, Shrubs & Flowers, Landscape Contractors Supplier, Specimen Plantations Grower | Delta, Tsawwassen, Langley and Lower Mainland | East Richmond Nurseries Inc.
East Richmond Nurseries Inc. - ERNI - Jane and Peter Levelton established their nursery in 1987 on 25 acres on Westminster Highway in Richmond, B.C. From the start their goal was to offer only top quality plants with unique and interesting characteristics. While the nursery has grown considerably, those goals remain. Their son, Jason, started working in the nursery while still in school at the age of 14 and is now not only the Operations Manager but a company shareholder. Dawn, their daughter, also worked in the nursery for many years but has chosen a different career path and is currently at UBC. The original vision was to field grow specialty deciduous and grafted conifers. As the industry has evolved, so has ERNI. We now grow a wide range of plants not only in the field but also in state of the art, gutter-connect greenhouses. In 2001, we underwent a major strategic change. Beginning with the renovation of our old dairy barn for office space and storage, we created a landscape supply yard offering plant material to the commercial landscape trade in the Metro Vancouver area. 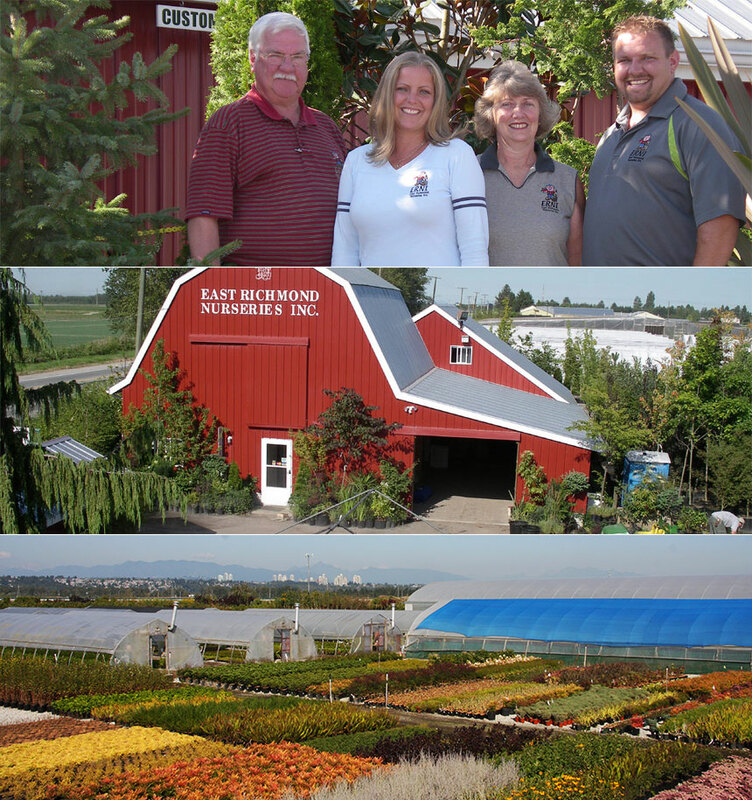 Centrally located at the heart of Metro Vancouver, ERNI and our family are here to serve.